Can you believe it! After all the excitment last week, we have another giveaway for you. A little treat to end the party. There will also be another giveaway on Monday, so be sure you check back. Odds are good the winner could be you. Yep, you. After you enter, scroll down for the CJane Soiree winners. Giveaway: Initial Wax Seal Necklace. It's a wax seal fob pendant inscribed with initial of choice and hangs with tiny rectangles for intimate initials and sentimental dates - making it a mommy necklace. 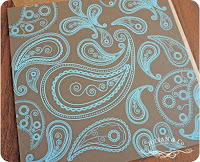 You will also get sealing wax and a set of JULIAN & CO signature paisley notecards. "After wearing many hats on my work path including an executive and cafe owner, my husband, Tony and I were eager to start a family. I soon became pregnant, but at just 29 weeks along, our excitement was interrupted when my water broke and I went into preterm labor. Julian was born at 3lbs 4oz and 11 weeks early. The long days and nights at the NICU were spent loving, holding and watching our Julian fight for his life and become stronger. Six weeks later our miracle was able to come home. Tony bought a bracelet at a baby boutique and had it personalized with Julian’s name. But when we went to put it on, it was much too big. I didn’t want to wait for him to grow into it, so I set out to design and make a sterling silver id bracelet for Julian. I became an expert at precious metals, using tools, even soldering and the first piece to our JULIAN & Co. line was born. But my inspiration didn’t stop there - filled with joy to finally have Julian home, I wanted to celebrate his life every moment of the day. I handcrafted sterling silver disc pendants adorned with Julian’s own hand and feet prints. I added his name and his birth date, and Tony and I wear them on leather cords. We received so many compliments on Julian’s tiny albeit stylish bracelet and our necklaces. Orders from family and friends poured in and the business seemed to grow overnight. I have always loved fashion, jewelry and creating. The entire JULIAN & Co. line is heirloom quality." 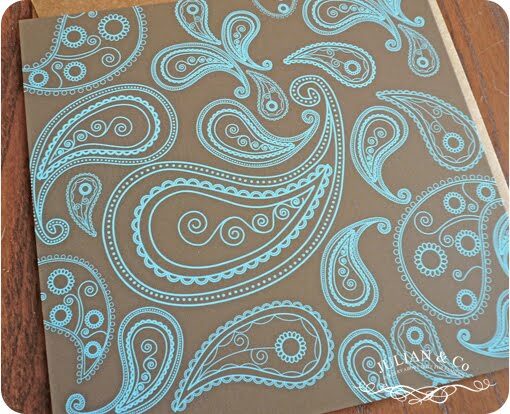 CJane will also receive the Initial Wax Seal Necklace as well as the sealing wax and a set of signature paisley notecards. It will be exciting to find out what date her little bundle will arrive. Make haste little baby, there is a necklace to adorn. Anyone want to take a guess at when CJane's newest addition will finally decide to show? Include your guess with your comment. Leave a comment on this post telling me which JULIAN & CO lovely you would like to wear. A winner will be chosen at random. Comments will close at midnight on Tuesday April 13th. Oooh I would definitely want to wear the Initial Wax Seal Fob Pendant. I'm loving the nursing necklace. I never thought of giving the baby something to play with to keep them occupied! Really cute!! The Initial Wax Seal Necklace is so unique and I love its clean design. I've never seen a pendant quite like it! Oooh, how pretty! I would love the del mar rectangle necklace. What beautiful pieces! I think the Initial Wax Seal Necklace is a very unique design! I love it and would love to wear one! I follow JULIAN & CO on facebook! Initial Wax Seal Fob Pendant is something I would proudly wear! RSS FEED subscriber using google reader to your site. I love the del mar locket. I am a FV Follower! I love the ID bracelet. This would be perfect for my little one. I subscribe to Family Volley via GoogleReader. I think I would pick the Life Squared option... love the shape and uniqueness of the piece! Thanks for the chance to win! I'm a follower! Of your blog and on FB! I am a letter writing person and love the wax seal cube necklace. It is such a unique piece. I follow FV and love it! I love the tiny rectangles! Life squared! It's so amazing! I love the life squared necklace, soooo beautiful! I asked fv a question. I LOVE the Round Locket. It is adorable. Oh I love the initial necklace!! LOVE!! I like the tiny rectangles. perfect and intimate. The Life Squared necklace, it's perfect. I would wear the initial wax seal fob pendant. I love the little girl's bracelet, with the tiny heart. So cute, and my 2 year old would love it! I became a fan of Julian & Co. on facebook. i left you a question at dfv and can't wait till it is answered! I am already getting great ideas from some of the other questions you have been answering this week! I like the tiny rectangles. I like the Jullian and Co small round locket. I am a Juilian & Co FB fan. I'm in love with the new wax seal necklace and drool over it all the time! I would love love to have the wax seal necklace. It would compliment my Baby Coins very well. I love the Life Squared Wax Seal. What awesome jewelry! Great Giveaway! I love the nursing necklace even though I don't have any nursing anymore. Beautiful design. Added FV to my google reader. Very excited to have found this site!! Am a J&Co. fan on FB! My dad would love that little do tag with his grandkids initials. How special and sweet! I love the wax seal. also a follower on Facebook of Julian & CO. I love the DEL MA Rectangle 18K necklace! I would totally wear this as a mom necklace!! So neat. This is the first time I've seen the wax seal, but would definitely love to have it. Love the wax seal and the round birth necklace - those tiny feet are adorable. Great giveaway! I love the wax seal necklace!! I would wear it everyday! I love the godmother necklace! i'm a Julian & co. FB fan! seriously? the wax seal necklace is about the most lovely thing i have seen in a long time-and i am old! The wax fob with the letter c would be perfect. I would love the DEL MAR Birth Square Nouveau. I subscribe to FV via Google Reader. I am a FB fan of Julian & Company. I just love the wax seal necklace!! I love the birth keychain for the Daddy in our home! I totally want the wax seal fob necklace! I've been wanting a wax seal for years! I love the mini Julian and Co. necklace! I also like all of the other ones with the hand and foot prints on them. I LOVE the wax seal necklace! I love my "dad tags," even though I'm the mommy!! I wear the first one, and the second is in shipment now. Ill have them both on one chain. I love the wax seal necklace, too, as well as the tiny tags! Ive given your website to many people who love my necklace! I would LOVE to have the initial wax seal necklace! I love the round birth necklaces with the little feet and hands. so cute. I love the wax seal necklace. I have bought the birth necklace for dad and mom for my son and daughter-in-law with my granddaughters information on them. They are absolutely wonderful pieces. life squared wax seal, so many beautiful pieces to choose from. The nursing necklace is so sweet! Love the lockets and the square wax box sealer thing. Everything looks amazing! it would have to be life squared, as that is the one on which i could fit something for all 5kids and my sweetheart.....and cjane's little one's arrival date....i'll go with today. I LOVE them all but that galleria necklace would be perfect with my 2 little ones' names! I love the Initial Wax Seal Fob Pendant. I love the idea of old-fashioned paper with a wax seal, so classic. Initial Wax Seal Fob Pendant--I love it!!!!!!!!!! I would love the life squared wax seal necklace!!! I follow FV!! Thanks for all the great giveaways. I love your work and your inspirational story! They used to have a NICU survivor necklace that I wish I would have gotten. I love the birth necklace. I love the round birth necklace. I love the golden Del Mar lockets, large and small! I love the tiny rectangles, and I think CJane's baby will come next Monday. I like the life squared wax seal. So pretty! I think CJane is a lucky lady with a lucky baby. Love this shower idea and love Julian and Co. I never take my square birth necklace off, but would definitely wear the wax seal necklace. I love the "mom" one! precious! I love the Initial Wax Seal Fob Pendant...sooo cute!! I love the necklace with the tiny rectangles. The personalization possibilities are endless! I like the Initial Wax Seal Fob Pendant the best. I love the Tiny Rectangle necklaces. I LOVE that wax seal fob pedant!!! Became a fan of Julian & Co. I like the Life squared wax seal. Very nice! I like the Initial Wax Seal Necklace a lot, but I also love the simplicity of the DEL MAR - Small Nouveau silver necklace. I love so many of them, but the little rectangles are darling! I love the wax seal necklace. I just sent a question too. I really hope you answer it! I love the wax seal necklace-definitely my favorite! I'm a FB Fan of Julian & Co. I love the infant ID bracelet with the little heart. Oh my goodness, any of them all would be amazing! I'm pretty smitten with the new wax seal! I adore the 'Heart on he Wrist' bracelet for my little girl. I am dying over the cuff links! i follow familyvolley in bloglovin, im also a fan of julian&co. 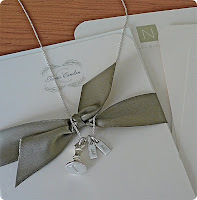 I purchased the small Del Mar necklace from you after my son was born in 2008 and LOVE IT! I am a follower on Facebook and email list! Everything at the website is so beautiful! If I had to choose I'd go with the birth necklace round. The mini julian in 18K. Beautiful. I like the small round locket! Love the tiny rectangle necklace. I would love love love to wear the large round locket!! I am a fan of Julian & co on fb! I love that nursing necklace even though I am no longer nursing. So beautiful! I follow fv via rss feed. Now I follow Family Volley. Not sure my first comment posted...I love the small galleria necklace. Thanks! Love the wax seal necklace! I'd like to wear the nursing necklace. Although the one in the giveaway is great, too. I think the wax seal pendant bob is spectacular. what a great idea! Love this necklace! Theres nothing like it! I Love the Initial Wax Seal Necklace...how cool is that? I would love to have one! I definitely think the Initial Wax Seal Necklace is my favorite. I follow volley and would love to win!! !